Has American Water Works Earned a Clean Bill of Financial Health? Born in 1996, Puddles, American Water's announcer, celebrates his 20th this year. Image source: American Water. Since last summer, shares of American Water Works (NYSE:AWK) have been riding a wave of bullish sentiment -- consistently reaching all-time highs. Is the market overly enthusiastic about a financially unsound company, or is this a business that investors can be safe swimming with? Let's dip our toes in and check out the company's financials to find out. Evaluating a company is a complicated endeavor. Recognizing growth is a welcome sign, but there can be -- and usually is -- much more to the story than just details from a couple of metrics. So comparing the company to its peers and putting the growth in context of the industry at large is a smart move. For example, looking at American Water's income over the past three years suggests that the company is performing superbly. Source: American Water Works 10-K. Growing operating revenue by 9.7% over the past three years is admirable, but it pales in comparison with the 28% by which the company has grown its diluted EPS over the same time period. Is this revenue growth standard for the water industry though? How about the earnings growth? 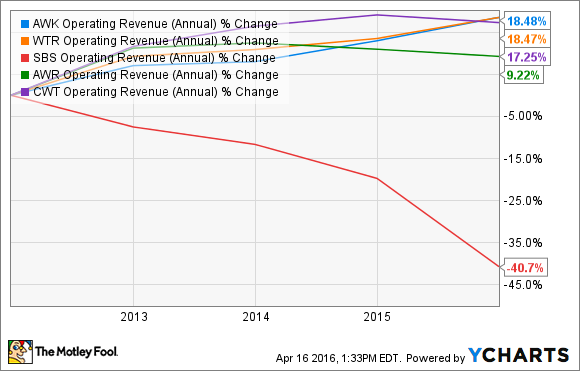 Over the past five years, American Water's revenue growth is on par with its largest competitor, Aqua America (NYSE:WTR). Relative to American States Water Company (NYSE:AWR) and California Water Service Group (NYSE:CWT), two companies whose operations are concentrated in California, American Water's growth is more remarkable. And, compared with its Brazilian peer, Companhia de Saneamento Basico do Estado de Sao Paulo (Sabesp) (NYSE:SBS), American Water's growth is awe-inspiring. Turning to the bottom line, though, is American Water's performance equally impressive? You betcha. In fact, it's significantly more impressive. Clearly, the company's ability to improve its efficiency is beyond compare. It measures its performance in this regard by the non-GAAP metric, O&M (operations and maintenance) efficiency ratio -- a modified operating margin of sorts. Steadily improving from 44.2% in 2010 to 35.9% (the lower the better) in 2015; management believes there's more room to improve, estimating a drop to 34% by 2020. The O&M efficiency ratio alone isn't responsible for the EPS growth. Revenue from the regulated businesses segment accounted for the lion's share of the improvement -- $0.18 per share. On the conference call, though, management credited an improvement in O&M costs -- 1.5% in the regulated businesses segment, accounting for EPS growth of $0.02 per share. Operating 49,000 miles of pipeline and providing service to more than 15 million customers doesn't come cheap; the business is certainly capital intensive. Asset renewal accounts for about 66% of the company's annual capex spending -- it replaces about 350 miles of pipe each year alone. Over the past three years, the company has averaged $3.02 billion in operating revenue and $1.03 billion -- about 34% of it -- is dedicated to capital expenditures. But with 86.8% of the company's operating revenue coming from its regulated businesses segment, the company can effectively forecast its annual revenue and appropriate capex spending accordingly. Management expects capital investment spending over the next few years to meet or exceed cash flows from operating activities. Should it need to curtail capex spending to preserve liquidity, management asserts that, with its operating cash flow, it can "meet our obligations and fund our minimum required capital investments for an extended period of time." 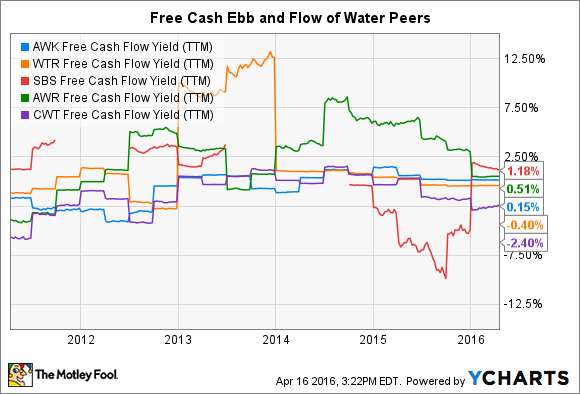 Evaluating American Water and its peers on their free cash flow yield, we get a sense of how well the companies are at converting their sales to free cash flow. 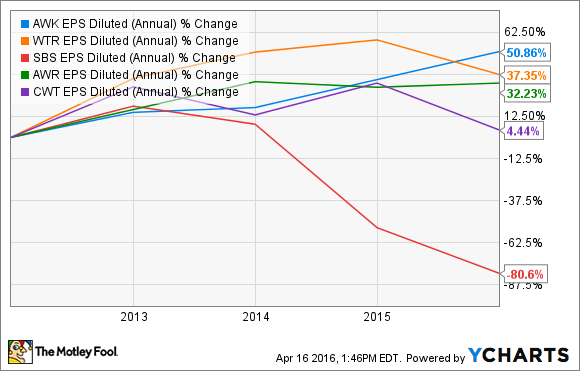 Though it doesn't outperform its peers, American Water is in good shape. It's maintained a positive yield since early 2014, and its current performance is better than what it's managed in more than 10 years. So far, we've found that American Water is swimming in profits, but that's not to say that a leviathan of debt isn't lurking underwater. With a debt to equity ratio just under 1.3, American Water may raise investors' eyebrows. But the company has demonstrated the ability to maintain -- and even lower -- its debt load while still prospering. Judging by another leverage ratio, debt to EBITDA, which illustrates a company's ability to generate operational profits to pay down debt, we find a similar situation. At a ratio just over 4.0 (on the high side), American Water may make some investors uneasy]. Though this on the high side, it has demonstrated the ability to manage it well, dropping it by almost 20% over the past five years. Sabesp, on the other hand, should be of greater concern as it currently struggles with the disparity between its revenue, in Brazilian currency, and its debt, largely in US dollars and Japanese yen. The high debt to EBITDA for Sabesp should be the most concerning. If further reassurance that the company's debt level shouldn't be of major concern is needed, one can turn to the company's recent 10-K. Management noted that in May 2015, Standard & Poor's raised the company's corporate credit rating from A- to A and confirmed its stable rating outlook. Later, in August, Moody's upgraded the long-term rating from Baa1 to A3 and affirmed a stable outlook. Time to take our toes out. At this point, it seems that these waters seem safe. Management forecasts 7% to 10% EPS growth from 2016 to 2020. 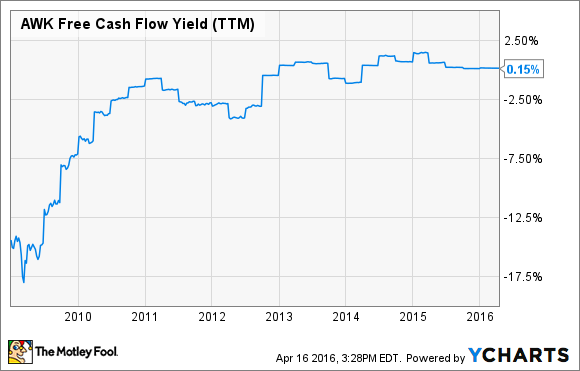 Cash flow seems steady, and management seems comfortable with the possibility of its ebbing. And though it's highly leveraged, Standard & Poor's and Moody's seem confident that the company could handle it.